The uncanny valley is a psychological phenomenon that refers to the uneasiness that comes with dealing with simulations that imitate human features and movements closely, like mannequins or CGI animations, but are unnervingly different. 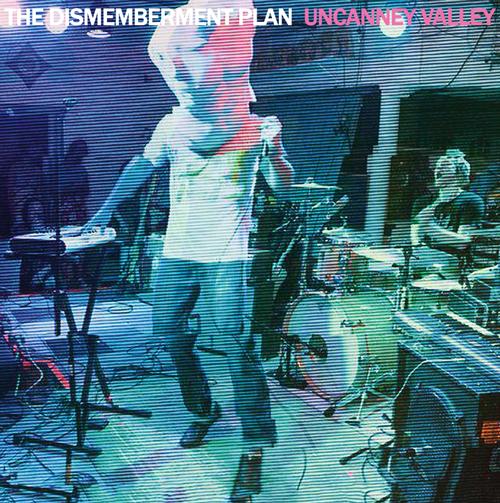 In that sense, intentional or not, Uncanney Valley ends up being the perfect title for the Dismemberment Plan’s fifth album and first in 12 years. Without a doubt this is a Dismemberment Plan record—Travis Morrison’s mercurial vocals and Joe Easley’s elastic drums confirm that—but there’s something…off. (And it’s not just the misspelled album title.) That “something” can be mostly attributed to the fact the band is a decade older and that 2013 is a much different year than 2001. Whereas a twentysomething Morrison spent the Plan’s early albums working through his anxieties and trying to cope with maturity, he’s now a man on the verge of middle age. With his concerns lying elsewhere, it makes some sense that the music is different: the band members are older and more comfortable with themselves, so it follows that their music is more comfortable too. This is still the same restlessly creative band of yore, but there isn’t the same urgency below the surface, that off-the-cuff inventiveness that made their best work sound so bracing and personal. That has a lot to do with the production, which is more expansive and polished than ever, snapping in samples and sound effects in and around songs like a puzzle, with every sound cleanly organized and mixed, even when it seems to come out of nowhere. In short, the Dismemberment Plan has never sounded this much like a well-oiled machine, yet once you get over the initial shock, Uncanney Valley ends up emerging as a sweet, hopeful, if not great, epilogue to the band’s story. It’s their shortest album, and that focus keeps things tight and accessible, even when the band navigates through their trademark stylistic turns, playing like a streamlined, ironed-out version of Emergency & I. That directness has its perks, though, especially given Morrison’s ear for off-kilter hooks: the jerky vocals make “No One’s Saying Nothing” a brighter, smoother take on Emergency‘s “A Life Of Possibilities;” the effervescent “Waiting” and skipping “White Collar White Trash” are great, skewed pop, and “Lookin'” is the simplest, prettiest song in the Plan’s catalogue. Uncanney is still too weird to be their version of Weezer’s Green Album, the 2001 comeback that heralded that band’s current status as goofy pop formalists, but it still suffers from one of Weezer’s major late-period issues. Now, Morrison shares some of Rivers Cuomo’s endearing/annoyingly corny humor (the “When I say…you say…” sequence on “Let’s Just Go To The Dogs Tonight;” the sexcapade satire “White Collar White Trash”) and fondness of earnest sentiment that can border on cliché (the sort-of cheesy but very hooky “Go And Get It”). It’s not so much the stab at humor itself that’s the problem—in a world drenched in irony and emotional distance, it’s weirdly a bit refreshing to hear him going for broke on silly dad-jokes—it’s that because of it, the whole album comes off as slight. And that’s especially disappointing considering Morrison was a damn fine lyricist, who found comedy in everyday tragedy and vice versa, and while there’s hints of that here (especially in “Waiting” and “Daddy Was A Real Good Dancer”), it’s generally tossed aside for something altogether flat. That might be a deal-breaker for some listeners, the way it was for Weezer’s fans, but the relative consistency of the songwriting here should help quell the discomfort. After all, it’s hard to argue with more Dismemberment Plan, even if what you were served isn’t what you ordered. Keep an open mind, and you might just go home happy.